Finance Costs > How Much Does Check Cashing Cost? How Much Does Check Cashing Cost? Cashing a check, while it sounds simple, may be inconvenient and sometimes difficult, especially if you do not have a bank account. When it comes to the fees, it will often depend on the amount of the check and the company cashing the check for you. Most check cashing services will either charge a flat rate or a portion of the check’s value. If the company charges based on the value, plan on spending at least one to three percent of the amount to have a check cashed. Companies that charge a flat rate for check cashing will usually be within the $3 to $10 range. Walmart, for instance, charges a flat rate of $3 per check as long as it is under $1,000. If the check is over $1,000, then the fee will be $6. They will cash checks up to $5,000. According to this US News, retailers, such as 7-11, charge a flat 0.99% convenience fee. They also note that many banks will not charge if the check is issued by their bank. If the check is not issued by the bank, a fee will be applied, which is usually around $10. For example, if someone who uses Bank of America gives you a check and you need it cashed, you can go to a Bank of America and they will most likely let you cash it for free, even if you are not a customer of theirs. Depending on the company, most will give you cash on the spot; however, major retailers may also offer the option of placing the money on a reloadable debit card or gift card if you choose this option. If the check is too large, they may not have enough cash on hand to give you. This is why most stores place a limit on the amount of the check you need to be cashed. Most companies will be able to payroll checks, government checks, tax checks, and money orders, but there may be restrictions. Always call or refer to the website of the company you intend on using to make sure they can successfully cash your check. 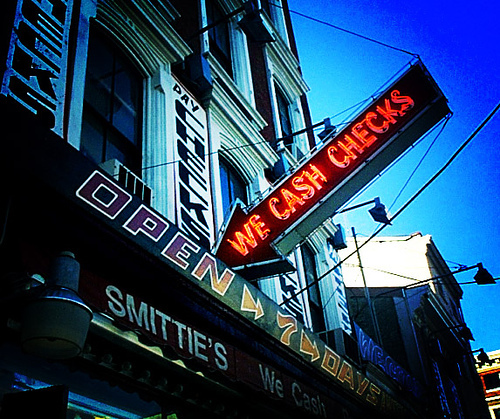 Most retailers may charge a processing fee on top of the cash checking fee. This processing charge can range from $3 to $6. If you want your funds loaded onto a prepaid debit card instead of cash, then a charge, often around $5, may be applied in order to load the funds. Some companies may only charge up to a certain amount, and most of the time, you will not be able to cash a check higher than $5,000. Some stores are strict on what they cash. For example, some may avoid cashing personal checks and will only do checks from a business or the government. Most states have laws as to how much a retailer can take out of a check when cashing. Refer to your local state laws to learn more. For instance, in New York, a financial service cannot charge more than 1.95% of the value. If your check has a major bank logo on it, consider going to that bank. Most banks will cash the check for free, even if you do not have an account. In order to cash a check, a valid government ID will be required. This is used to make sure that you are actually the person to whom the check is made. If you have to cash multiple checks throughout the year, highly consider signing up for a bank account. A lot of credit unions and banks offer checking accounts with no minimum amount required. Even if there is a minimum, it is usually only $5 or $10. With an account, you will be able to cash and deposit checks for free. Check cashing services offer no value at all. You have to ask yourself why you are choosing this type of service. Unless it is going to be free or there is some sort of promotion, you will be better off with a bank account. Always avoid a payday lending store as these stores may charge up to 10 percent of the check value.